“The Illuminations Project” is the result of a decade-long collaboration between Boyle and Duke. 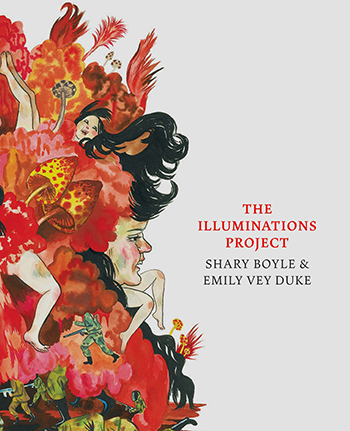 Artists, feminists and friends Emily Vey Duke and Shary Boyle will launch their new book “The Illuminations Project” at an event for Syracuse University alumni and friends on Tuesday, March 15, from 6-8 p.m. at Lubin House, 11 East 61st St., New York City. Duke is an associate professor in the College of Visual and Performing Arts’ (VPA) Department of Transmedia. “The Illuminations Project” is the result of a decade-long collaboration between Boyle and Duke. Their visionary call-and-response forges connections between subversion and joy, drawing and writing. It is an exquisitely rendered road map through the chaos of growing up female, fearless and hungry for meaning. Printed in its entirety in this 96-page book, “The Illuminations Project” assumes an epic structure, embracing free-form ideas as readily as the drive for narrative momentum. The project loosely charts the journey of a character named Bloodie, a young girl who travels across fantastical lands populated by all manner of creatures—human, animal and otherwise—including fellow traveler Peg-Leg and his gang of Wild Boys. Drawing on philosophy, religion and myths alike, the tale that unfolds speaks potently to the freedoms and dangers of the wild, the nature of power and desire and the brutalities of contemporary life. Boyle works across diverse media, including ceramics, sculpture, painting, installation and drawing. She maintains a dual practice alternating between her studio and collaborative touring of projection/sound performance projects. Duke is an artist and writer who works mostly in collaboration with her partner Cooper Battersby. They live in the countryside in New York State in a house full of animals. For more information about the event, contact Allison Kirsch, VPA special events coordinator, at aakirsch@syr.edu.